Jamie Lloyd Productions will present the 50th anniversary production of Harold Pinter’s The Homecoming at Trafalgar Studios 1 in London from November. First performed in 1965 and receiving a Tony Award for Best Play after the 1967 New York production, this version starring Gemma Chan is set to run until February 2016. Trafalgar Studios has been home to many Jamie Lloyd Productions over the past few years, most recently including The Ruling Class with James McAvoy and Richard III with Martin Freeman. The Homecoming is set to be the next successful show in a line of fresh and accessible theatre. When Teddy and Ruth return to London, Ruth is plunged into a family tortured by mutual loathing and resentment. Teddy’s father, brothers and uncle live in a motherless, compassionless home, and Ruth soon becomes the centre of attention. Very quickly, the men find themselves in a battle of one-upmanship, constantly fighting to impress her. The Homecoming is known as one of Pinter’s pivotal plays, exploring absence and female influence. Directed by Jamie Lloyd, this production will feature Design by Soutra Gilmour, Lighting Design by Richard Howell and Sound Design by George Dennis. The cast will feature Gemma Chan as Ruth and Gary Kemp as Teddy. Other members include John Simm as Lenny, Ron Cook as Max, Keith Allen as Sam and John Macmillan as Joey. 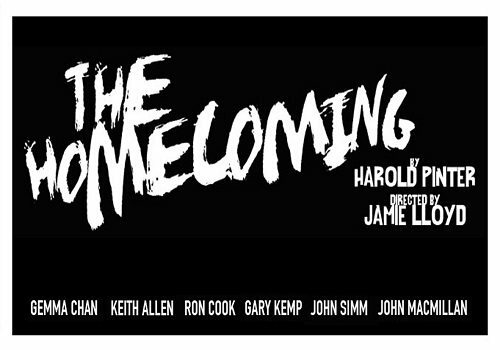 The Homecoming will run for twelve weeks from November 14th 2015 to February 13th 2016. Contains strong language and moderate themes.